After an almost-five-year trip, the arrival to Jupiter of the American spacecraft Juno is near! On Independence Day Juno will be arriving to insert itself into orbit, to begin mapping its magnetic field and search for firm evidence of a solid planetary core. On Friday 18 March, there will be a talk at the Highland Road Park Observatory entitled "Juno to Jupiter". The talk begins at 7:30pm, is aimed at an adult audience and has no admission fee. The last stretch of the countdown is here! 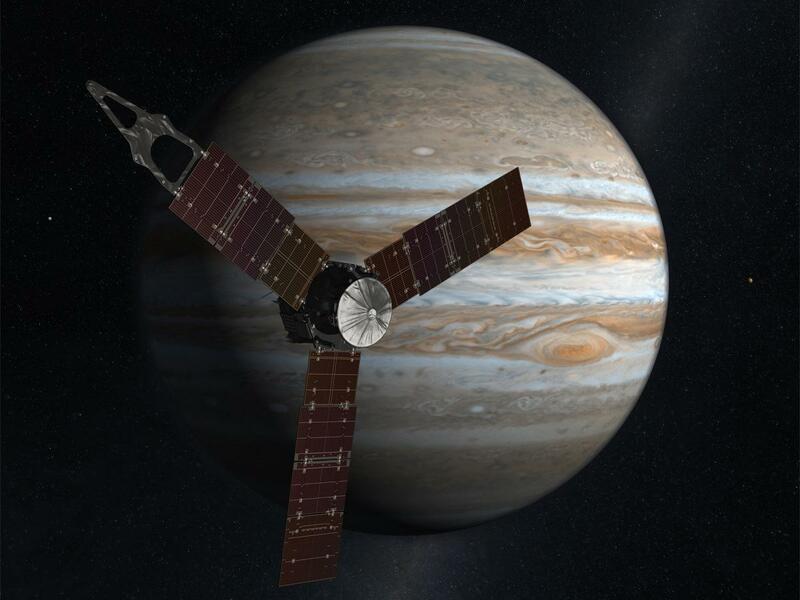 Juno will insert into orbit around Jupiter on 4 July. On Independence Day, a pre-orbit insertion briefing will take place at the Jet Propulsion Laboratory at 11am CDT. The actual insertion is expected at 9:30pm CDT that night. The Highland Road Park Observatory will be open from 7pm to 11pm on Independence Day to celebrate the live confirmation from NASA that Juno has successfully entered orbit around Jupiter. The event has free admission and is for all ages. The countdown is getting shorter! Danko's Clear Dark Sky states that during HRPO's event time both the transparency and seeing ratings will be "average" (3 out of 5). Our event will begin with a showing of NASA's rebroadcast of the final media briefing for the Jupiter Orbital Insertion. Live coverage for awaiting the "yea" or "nay" of actual JOI will begin at 9:30pm. We will have cake and refreshments beginning right after the media briefing rebroadcast. A magnitude -4 Iridium flare is predicted for 8:34pm CDT, and a predicted visible pass of the Hubble Space Telescope beginning at 9:21pm CDT. We've had plenty of fun so far! Several kids won stickers, bookmarks, rulers, erasers and pencils (and very nice Juno posters courtesy JPL) via two games--a helicopter target drop and Juno multiple choice quiz. HRPO screened about forty-five minutes' worth of Juno media and promotional footage. We're still open until 10pm CDT. We're waiting with the proverbial "bated breath" to see if the JOI is successful. Stop by...this is getting quite suspenseful! Success! Pasadena has received the tones indicating Juno has reached orbit. Right now there is a live science briefing. The team just ripped up its contingency plan, to cheers from the audience. Last night during the post-JOI briefing the science team released an absolutely stunning video, showing for the first time (in what can honestly be termed a "video") a group of moons orbiting its parent body. It's really amazing. The video is at the top of the NASA Juno mission front page right now. The music is from Vangelis. Due to HRPO's staff using hours for Monday night's party, the Highland Road Park Observatory will not be open tomorrow night. There will be regular Saturday hours.